Dhow being a generic name for a variety of sailing craft most often associated with Arab sea men. This fine, atmospheric painting measuring 63 x 53 cms (25″ x 21″), oils, is one of four ‘dhow paintings, I still have in store, available, £2,000. 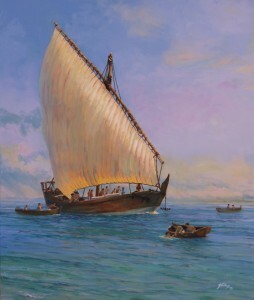 Dhows could be found and in many cases still can be found throughout the Arabian and Persian seas, Indian Ocean and East African coasts where they are still built by ancient methods including some, stitched together using techniques that would have been familiar to the sailors of King Solomon and the Pharaohs. Today, many still trade throughout the Indian Ocean, a few sail as beautifully finished private yachts. 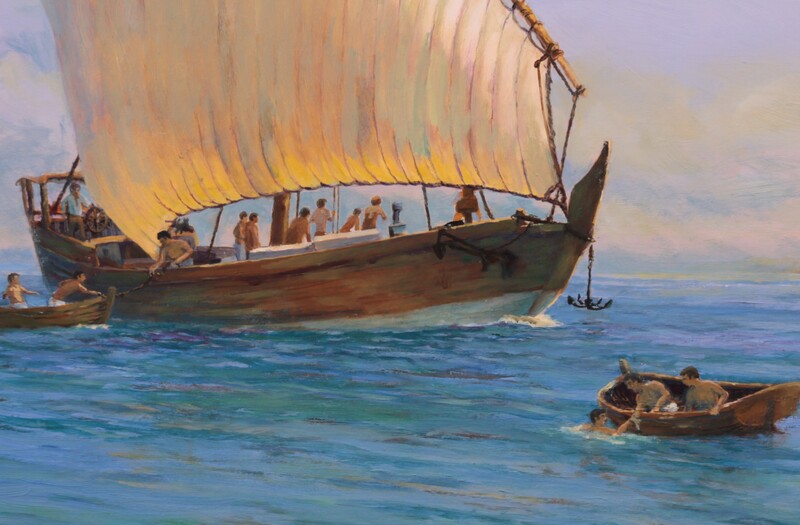 These ‘Sanbaq’ dhows, vessels build by a method of ancient construction, planks sewn together just as ships found in tombs of Pharaohs’ were, have seen more adventures than there are in Arabian Nights and are still used by Somali Pirates! This marine painting started life as one of a pair, a commission for the Royal collection of the Government of Oman who bought the other and are unaware of this second similar painting which is in store at my studio. Thus this is your chance to own a painting directly comparable to one in a royal collection ! This painting was one of 35 displayed for the first time in public at the invited Exhibition “ Life on the Ocean Wave of The Marine Art of Gordon Frickers” at the European Parliament, Brussels, May 2011.